As climate change continues to roll out new and increasingly unpredictable conditions all over the country, it’s becoming clear that, for some communities, water scarcity is a problem that isn’t going to be solved when the weather “goes back to normal.” This is especially true when extremes of flood and drought are compounded by landscape urbanization, water use and outdated infrastructure. How do we solve seemingly insoluble environmental problems like these through partnerships and collaborations forged at home, in our communities, watersheds and local governments? In Georgia, American Rivers and our partners are working on these challenges in the upper Flint River, whose headwaters spring up just north of Atlanta’s international airport—the busiest airport in the world—and flow to the Fall Line of central Georgia between Macon and Columbus. Since 2013, American Rivers has convened the Upper Flint River Working Group, a voluntary collaborative of diverse partners who share the same vision for this watershed: to maintain a river system healthy enough to support the various social, ecological, recreational and economic benefits the upper Flint River system provides. 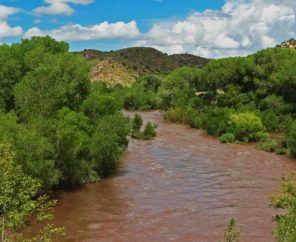 These include water supply, recreation, fisheries, property values and a healthy river ecosystem, to name a few. The Working Group is made up of the leadership of all the large water utilities in the upper basin, local conservationists, non-profit conservation organizations, and Hartsfield-Jackson Atlanta International Airport staff. Arguably more than any river in the Southeast—or even the eastern United States—the Upper Flint is suffering the strains of water scarcity. Since 2000, the river basin has experienced four major droughts that have caused alarmingly low river river flows: 30 to 50 percent lower than anything seen in the 20th century, even during the driest times. During these dry periods, the upper Flint shrinks to a trickle, signaling the river system is less resilient to drought conditions than it once was. This makes the upper Flint a good place to dig deeper into a collaborative approach to addressing the challenges of water scarcity. 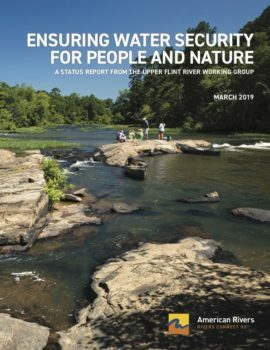 After five years of working together, the Working Group developed Ensuring Water Security for People and Nature, a report outlining the group’s progress and the inroads it’s made into addressing water security and drought resilience in the basin, both for the ecology of the river and the communities that depend on the river for water supply. To document the five-year history of the Upper Flint River Working Group, where dialogue and collaboration have led to key achievements and successes. These successes include new water infrastructure that returns more water to the Flint and protects major tributaries from extreme low flows, initial improvements to reservoir management on the county level, new research performed by municipal governments into regional water supply dynamics, and green stormwater infrastructure installed at the Atlanta airport. To publish the group’s consensus-based goals for managing the river system in the future. To share future plans for actions to improve water availability for people and nature in the basin, such as pursuing water efficiency and conservation, further improving reservoir management, utilizing green infrastructure at multiple scales to manage urban runoff, and protecting lands that support healthy flows in the Flint. As Working Group participants have gained an increased awareness of the critical nature of drought flows in the upper Flint, they have chosen to emphasize and accelerate the implementation of projects that support mutual goals of the group. All these projects—and more on the way—will improve drought resilience and water availability for people and nature in the upper Flint basin in the future. Going forward, the Working Group also plans to collaborate with additional river stakeholders and with scientists researching the upper Flint who can help improve our collective understanding of environmental water needs and hydrologic trends in the basin. In addition to restoring healthy flows and drought resilience to the Flint River, American Rivers and the Upper Flint Working Group are testing a process as much as a product. We’re hopeful that further success in this voluntary, collaborative process for addressing shared water resources can help inform the way communities nationwide approach 21st-century water scarcity and security challenges.